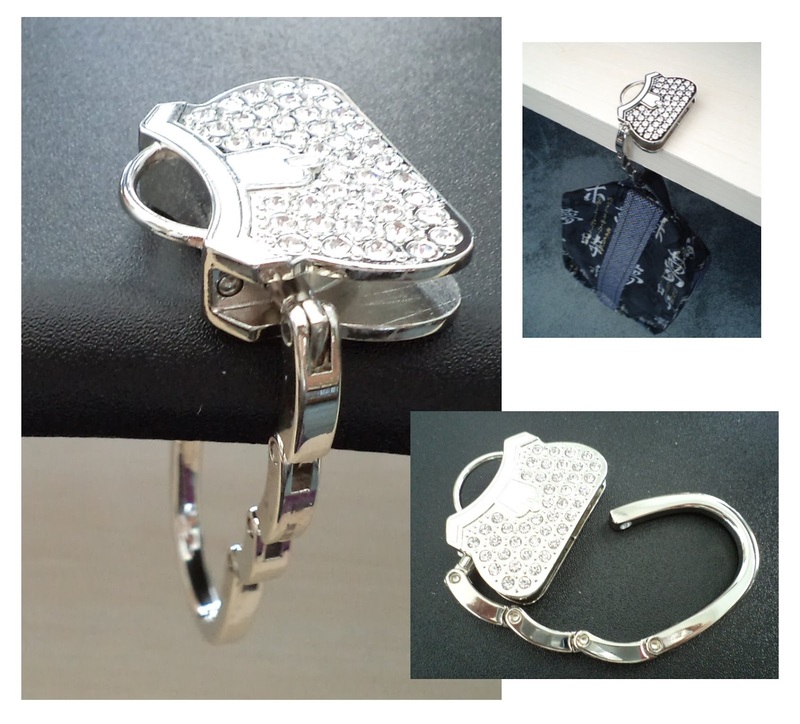 My new purse hook becomes an integrated part of my bag bling! First of all, let it be firmly stated that I am neither a trend setter nor a trend follower by any means. Nor am I any sort of self-described fashionista with insider info on what's new and hot. When I made my customized version of the Summer Sling Bag, one of my additions was a hanging loop to allow the use of a purse hook. At the time, the purse hook I had was several years old; it was a basic one from a breast cancer fundraising campaign with a pink ribbon emblazoned on it. Nothing special, it wasn't foldable and had to be carried inside my bag with the rest of my stuff. In and of itself, a purse hook is functional. For something functional to provide bling to a bag is awesome, don't you think? The next items that I came across are helpful to keep your purse or bag organized. These little things are quite interesting and I would assume they might actually be useful. Price is 99¢ CDN for a set of two. This thing has a section of mesh pockets on top of regular pockets on both sides, a couple of zippered pockets along the top edges, and a large open central area — with handles for easy removal — to keep all of your messiness in one place! There are even some snap fasteners along the ends to make the unit thinner if needed. I'm sure I could figure out how to make one, but really, what would be the point? This is an example of the embellished leather straps that are currently available on eBay. (Can't say that I'm a fan of the look, however.) It's about 35" long and priced at $41.99 USD. I get that it's real leather, but really — forty-two bucks for a strap? At a more reasonable (but still kinda pricey) $9.10 USD each, these are Chanel-inspired straps in faux leather and chain. These braided velvet purse straps are available in lengths up to 47" and are relatively bargain priced at $1.89 USD. Last but definitely not least — while we're on the topic of straps — I stopped by Janelle's blog (Emmaline Bags) last week and found out that she is introducing a new line of strap anchor hardware to her shop. Some are really distinctive looking. What's more, she's also released a free bag pattern to show you how to showcase them, so if you're wanting to add a new and exciting feature to your handmade bags, be sure to take a look. Are you an eBay shopper? If not, why not? If yes, what's the absolute best purchase you've ever made on eBay?